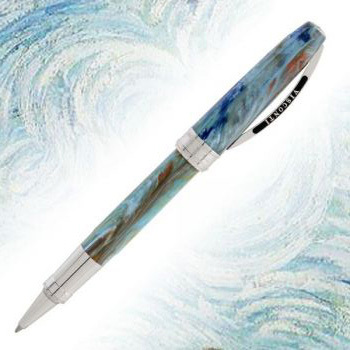 The Visconti Van Gogh Impressionist Collection is inspired by paintings from one of the world’s most acclaimed artists, Vincent van Gogh. Van Gogh’s most famous works – Self Portrait in Blue, Starry Night, Room in Arles, Irises and Sunflowers – have become pens through a meticulous and painstaking choice of color palettes. Visconti has worked hard to accurately reflect the technique and emotion of each of these paintings. 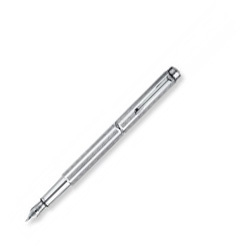 Made from natural vegetal resin, each pen features Visconti’s eighteen-faceted design, the many edges enhancing the vivid colors of the pen. Each pen features silver trims – the name of the painting and artist are delicately engraved around the pen’s ring – and each pen comes packaged in a unique pyramid gift box that is complemented with a faithfully reproduced canvas of the painting. 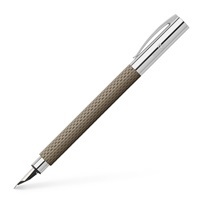 Visconti’s eighteen-faceted design enhancing the vivid colors. Name of the painting and artist is delicately engraved around the pen’s ring.